Are meetings taking over your life? You’re not alone. Meet Iris, a sales director so overwhelmed by meetings that she feels like a hamster on a wheel—in fact, she’s turned into one. Just in time, she meets a coach—a leading meeting efficiency expert—with a simple system that helps her regain her sanity and humanity. The coach’s secret is a laser-like focus on the five biggest meeting pain points: 1. Meeting overload: Professionals waste twenty-four days a year in useless meetings. 2. Missing success ingredients: ninety percent of all professionals attend meetings that lack a clearly stated objective and agenda. 3. Virtual-meeting chaos: Disinterested participants + endless technical glitches huge amounts of wasted time. 4. Agenda adrift: Goals are missed when meetings veer off course. 5. Action distraction: Incomplete action items result in delayed projects and missed deadlines. The coach demonstrates that these five challenges are damaging Iris’s career and costing the world over a trillion dollars each year. He provides practical new solutions that rapidly transform Iris from victim to victor. These solutions are tailored to the technology-driven world in which Iris lives—she discovers how to use e-calendars, PDAs, and virtual meetings to make her life easier, not more complicated. She applies the solutions, gets immediate results, and reclaims her life. 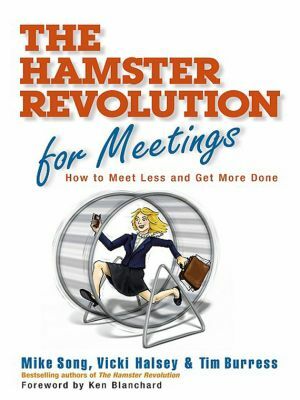 The Hamster Revolution for Meetings focuses on a small number of high-impact best practices that really work. Included is a landmark case study that shows how 3,000 Capital One associates reclaimed ten days per year while improving meeting effectiveness by over 35 percent.